ORLEANS — Conferences and workshops can have a perception of being dull and boring ­— hours of lectures and a seemingly endless loop of technical information. But an upcoming workshop in Orleans, designed for teachers, should sound more like a party. The workshop, presented by Dr. Holly Burton Hoffman of Central Michigan University, will look at the role humor can play in the classroom to better engage students and enhance the learning experience. The workshop will provide techniques a teacher can use to incorporate humor, basic modifications for existing lessons, how to become a more approachable person, and more importantly, to laugh. The event will serve as a “how-to” for teachers on engaging students in appropriate humor. “I’m really looking forward to this class. There is lots of research on how humor in the classroom can help cognitively, socially and help with self-esteem,” said Hoffman. Hoffman, who specializes in early childhood development and special education, has done extensive research in humor and made it the focus of her college dissertation. She went all over Michigan and sat in on countless classrooms focusing on humor. “Everyone said that when you pick a topic for your dissertation, pick something that you really love cause you’ll be immersed in it. Don’t pick something that will drive you crazy,” Hoffman said. “People asked ‘You are studying this for your dissertation? Isn’t this a serious degree?,” Hoffman said. She pointed out that many adults benefit from comedy, in books, sitcoms and movies but wondered why the same did not apply for children. She also believes if students look forward to something they may remember it more. Hoffman believes while teachers who take a more light-hearted approach can often see benefits in their students, they also must have a strong sense of classroom management. Classroom teachers are often faced with an overwhelming amount of data, assessments and stress. Hoffman believes adding humor to an everyday lesson may make the workload easier. “To me I really think of (humor) as a coping mechanism, not only with the students in the class but also for the teacher,” she said. Hoffman added, utilizing humor can engage the students, make them more responsive and improve their experience in school while costing little to the school’s budget. “It doesn’t really cost any money … it’s about adjusting the attitudes of our students,” Hoffman said. She believes educators who come to the workshop gain more than a laugh or two. The workshop will provide 5.5 contact hours, which can be used by teachers for license renewal. Teachers in Indiana are required to renew their licenses by completing college courses or attending workshops such as these. Teachers must earn 90 Professional Growth Points to qualify for renewal. Every contact hour in professional development equals one point. Burton’s farm has been working with Ivy Tech Community College since the fall of 2009 offering personal and professional growth classes for adults. 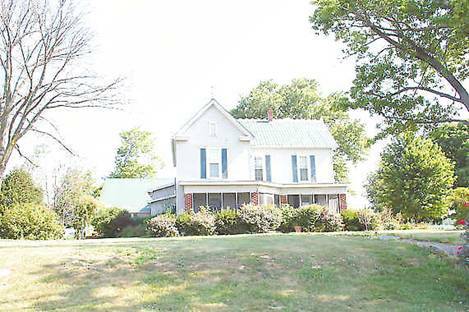 Burton hopes the farm serves as a gathering place for enrichment, relaxation, learning and fun. “My hope is that people will come here and feel welcome and relaxed,” she said. The cost of the workshop is $79, and will be from 10 a.m. to 4 p.m. for more information visit www.ivytech.edu/orangecounty and choose “Short-term Training” or call (812) 330-6044. Heather Nichols is the journalism teacher at Paoli High School and is serving an internship this summer with the Times-Mail. What: Teacher workshop, “The Value of Humor in Teaching” — a “how-to” for teachers on engaging students in appropriate humor. Info: Visit www.ivytech.edu/orangecounty and choose “Short-term Training” or call (812) 330-6044. As part of Ivy Tech-Bloomington’s early college offerings, the biotechnology program is holding a free nine day workshop to area high school students July 9-19. The workshop will introduce high school students to the life sciences industry and career options in the field. Sixteen high school juniors and seniors will earn three college credits for Ivy Tech’s BIOT 100 course and gain experience in a high-demand industry in the greater Bloomington area. Students will have the opportunity to learn about biotechnology careers, meet professionals in the field, tour a local biotechnology company, and gain hands-on, practical lab experience. Some topics they will learn about include: How to determine if food is genetically modified using the PCR (polymerase chain reaction) technique, safety and regulatory guidelines in biotechnology, and how to make glowing bacterial cells using genetic modification. For the past three years, the workshop has been funded by a congressionally directed grant from the U.S. Department of Education (Office of Postsecondary Education). Workshop registration for this year is closed, but for information about additional biotechnology programs for high school students, please contact Sarah Cote at scote@ivytech.edu. The workshop will be held at the Indiana Center for the Life Sciences (ICLS), a facility used by regional life science firms to meet their training goals for existing workers, and by Ivy Tech to prepare students for a career in the life sciences. Anyone interested in the ICLS facility can contact Clint Merkel at cmerkel2@ivytech.edu. For information about Ivy Tech degree program offerings, visit www.ivytech.edu. Ivy Tech-Bloomington announced today the addition of a Baking and Pastry concentration to the Associate of Applied Science (AAS) degree in Hospitality Administration. The Hospitality degree also offers a concentration in Culinary Arts. Restaurants, hotels, clubs, grocery stores, commercial, and independent shops are constantly seeking bakers and pastry chefs with the necessary skills and experience. This area of study is tailored to prepare a graduate to satisfy industry demands and American Culinary Federation Standards for Baker certification. Graduates from the Hospitality Administration degree program can start careers as cooks, chefs, bakers, convention center managers, event planners, food service managers, lodging and restaurant managers. Registration for fall classes is open, and classes begin on August 20. For more information about the Baking and Pastry concentration or the Hospitality Administration degree, contact Jeffrey Taber at (812) 330-6267 or jtaber3@ivytech.edu. Everybody has ideas; entrepreneurs act on them. These days, entrepreneurship is where the action is in Bloomington. In informal meetings at coffee houses, at structured gatherings around catered food and drink or during intense weekends of brainstorming and collaboration, a community has developed around the nexus of ideas, talent and investment. Pursuing dreams, solving problems, finding partners, chasing money — participants in Bloomington’s “startup culture” have a multitude of motivations. Any one of them could plant the business seed that grows into the next ExactTarget, an Indianapolis-based interactive marketing company that was founded in 2000 with an investment of $200,000. Now with offices around the world, ExactTarget reported $64.1 million in revenue during the first quarter of 2012, and its stock market launch in March was the exact opposite of Facebook’s — ExactTarget’s stock rose 32 percent on the first day of public trading. Perhaps the next big thing will come from Henry Graves, whose idea for a social media website for fishing enthusiasts won a Startup Bloomington Weekend competition in May. Graves said he spent every available moment fishing or thinking about fishing while growing up in South Holland, Ill. He was so passionate about the sport that he memorized all of the Illinois state fishing records and had considered becoming a professional fisherman after high school. However, he said, his father had a different vision for his son, and Graves ended up at Indiana University in Bloomington, where he obtained a degree in finance. That’s where he met Winston Kotzan, of East Chicago, a fellow member of IU’s Undergraduate Finance Club, and his future partner in CatchMyLunker.com. Graves said the concept for a Facebook-like website for anglers came to him in 2007. His idea was to create a site on the Internet where fishermen and fisherwomen could post photos and information about their catches, organized by lake and region, so that other anglers could research fishing hot spots online and network with one another. Revenue would come from advertising purchased by fishing guide services, equipment manufacturers and fishing shops. Now living and working in Indianapolis, Graves’ Startup Bloomington presentation in May included a prototype mobile application, market data and feedback from potential advertisers. Graves said he and Kotzan plan to launch the website at the end of July after pitching their idea at Verge, an Indianapolis group that functions much like BloomTech as a place to meet other entrepreneurs and to share experiences. Start-up events around the country are an outgrowth of Startup America, a nonprofit organization launched in early 2011 to direct resources and expertise to new companies as a way to stimulate job creation. The organization now claims to have more than 7,500 member startup companies that provide more than 44,000 full-time jobs and 19,000 part-time jobs. There is a Startup event somewhere every weekend that brings together people with ideas and people with skills to help those ideas become businesses. At the most recent Bloomington Startup Weekend, presenters hailed from Cincinnati, Indianapolis and Terre Haute, as well as the immediate Bloomington area. No one seems too concerned about somebody stealing their inspiration. Here’s how a Startup Weekend works: Participants “pitch” their ideas to those assembled on Friday evening, who then vote on which one should move forward during the weekend. Teams form around the selected ideas to provide development support. A panel of judges hears final presentations from the teams on Sunday and announce winners. Matt Burris attended his first Startup event last November; he was one of the organizers of the May event. BloomTech is a place where those conversations take place on a monthly basis. The evening meetings are mostly networking affairs with food and drink, but the program usually includes a pitch of a new idea and advice from at least one entrepreneur who has tread the path of small business creation. At the May meeting, for example, Graves presented his concept for the ultimate fishing website. Then, Logan Rush of 1 point interactive, a company specializing in website design and email services, explained how he went from being an intern at Angie’s List to executive vice president of his own business. An environment for entrepreneurs to connect with creative people was precisely what Carlile, Kalmadi and other BloomTech organizers had in mind when they formed the group, whose first meeting was in February of 2011. Attendance soared this spring when the group moved from a coffeehouse on Kirkwood Avenue to a larger venue, KRC Catering on College Avenue; the turnout went from 35 people in March to 120 people in April and 65 people in May. Perhaps the next big thing will walk in the door of the Gayle and Bill Cook Center for Entrepreneurship at Ivy Tech Bloomington. The center was established in 2010 to build a curriculum for entrepreneurship at the community college, but it also serves as a resource for people wishing to start their own business. Executive director Steve Bryant said the staff has talked with probably 150 individuals in the past year and half about their business ideas. Bryant said the center can offer advice to people who want to start a business and direct them to other places for assistance, such as the Indiana Small Business Development Center, the chamber of commerce or the Bloomington Economic Development Corp. The center hosted a Startup Weekend event last November and intends to do so again this fall. Verge: A community of tech entrepreneurs, software developers and business investors in Indianapolis. Find out what’s happening at vergestartups.com. Larry Swafford, dean of the School of Health Sciences at Ivy Tech Community College, was awarded this year’s annual Glenn W. Sample Award for Excellence in Instruction. Swafford received the award, which is the highest honor for a faculty member granted by Ivy Tech, during the college’s annual President’s Awards event. 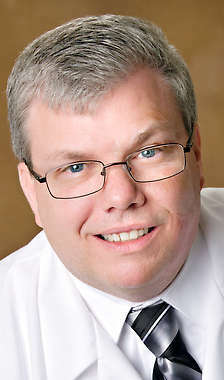 “Through his ability to create innovative collaborations with industry partners, Dr. Swafford has afforded his students unique educational opportunities by providing access to state-of-the-art equipment and expert industry training at both Indiana University Health Proton Therapy Center and at the ProCure Training and Development Center in Bloomington,” John Whikehart, chancellor of Ivy Tech’s Bloomington campus, said in a prepared statement. Swafford began teaching at Ivy Tech’s Bloomington campus in 2006 as the professor and program chairman of the Radiation Therapy Degree Program, the only two-year radiation therapy program in the state. Swafford developed not only the state’s only Associate of Science degree in radiation therapy, but also the nation’s first and only Proton Therapy Specialist Certificate. During his time at Ivy Tech, Swafford has graduated 36 registered radiation therapists and 53 proton-certified students. In January, Swafford’s Proton Therapy Specialist Certificate program was also nominated as one of 10 national semi-finalists for the Community College Futures Assembly Bellwether Award for Innovation in Workforce Development. Following Thursday’s ceremony, Swafford said he was shocked to receive the honor but excited for the field of radiation therapy to be recognized. Having served as a staff radiation therapist for many years, Swafford said he tries to use his own real world experiences to help teach his students. Being a part of Ivy Tech’s radiation therapy program, he said, allows him the best of both worlds. Although Swafford said he is proud of the program he has developed and the accomplishments it has seen so far, he is most proud of his students’ accomplishments. BLOOMINGTON — Students at Ivy Tech’s Bloomington campus can now work toward and earn an Associate of Fine Arts degree. The degree was recently approved by the Commission for Higher Education. It is being offered to meet the demand for regional employment in the arts, to support regional arts activity, and to allow students to transfer to four-year universities to earn a bachelor’s degree in art, according to a news release from the community college. The degree “transfers seamlessly to the Herron School of Art, the School of Informatics at Indiana University-Purdue University at Indianapolis, Indiana State University and Saint Mary of the Woods College in Terre Haute,” noted the news release. Currently, only the general education courses of the degree transfer to IU Bloomington. Ivy Tech’s Bloomington campus is the Indiana Arts Commission Regional Arts Partner for Region 8, which includes Brown, Greene, Lawrence, Monroe, Morgan and Owen counties. For more information about degree options, visit www.ivytech.edu or call 888-IVY-LINE. At 15 years old, guitarist A.J. Flynn is serious about his desire to be a successful musician. The Bloomington native has been writing and playing music for the past few years. “I’m in the middle of recording my own album, and I’ve been recording with bands for the past couple years,” he said. While being in a recording studio is nothing new to A.J., marketing and selling his music is a different subject. 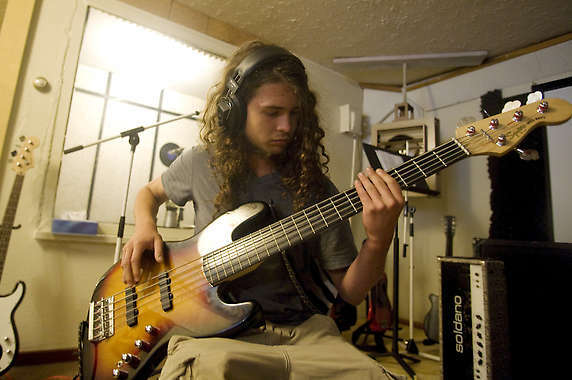 That’s why he decided to take part in a recent Ivy Tech summer camp program that provided teenagers like him a chance to learn about the business side of making music. A.J.’s musical education was all part of the first Ivy Biz for Kids, Entrepalooza class, held through Ivy Tech’s Gayle and Bill Cook Center for Entrepreneurship. High school students participating in the camp each brought individual musical experiences. 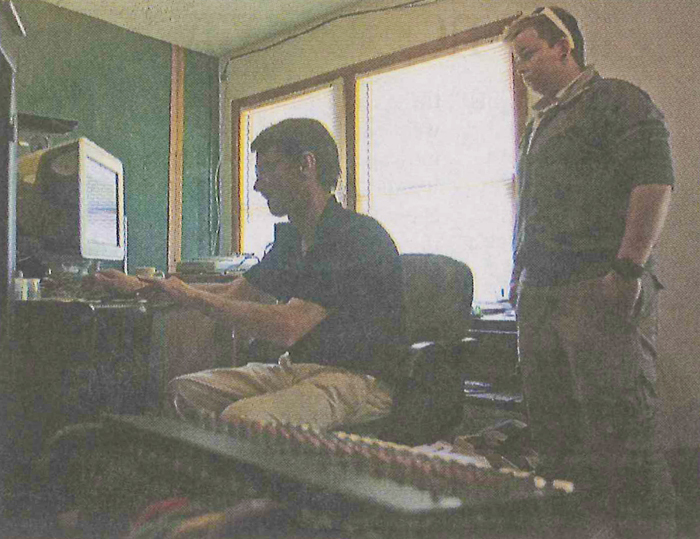 Throughout the week, the teenagers learned the ins and outs of laying down a track, including recording techniques from Phillip Traicoff, owner of Renegade Studio, who guided the sessions and mixed the music. In addition to being able to record their own CD, the teens also learned the business side of making music that involved writing a business plan outlining how they are going to sell their music, who their targeted audience is, how they will promote their music and the financial costs of cutting and promoting a record. The marketing side of the business was definitely a new lesson for 13-year-old pianist Jack Clarke. Coming from a musical family, Jack has been playing the piano/keyboard for the past five years and also plays the saxophone. While he has performed live, Jack, who recorded “Prelude in E Minor,” had never been in the studio, an idea that he admits had him rattled in the beginning. Although the teenagers’ musical tastes were quite different, their love of music brought them together, allowing them to celebrate each other’s accomplishments throughout the week. For Ali Bryant, who traveled from Zionsville to be a part of the camp, Entrepalooza was a fun way to learn about how to turn her passion for singing into a possible career. Being among her peers, she said, made the experience that much more fun. “It makes it more relatable because you get to see other people like you who are doing it, too,” she said. 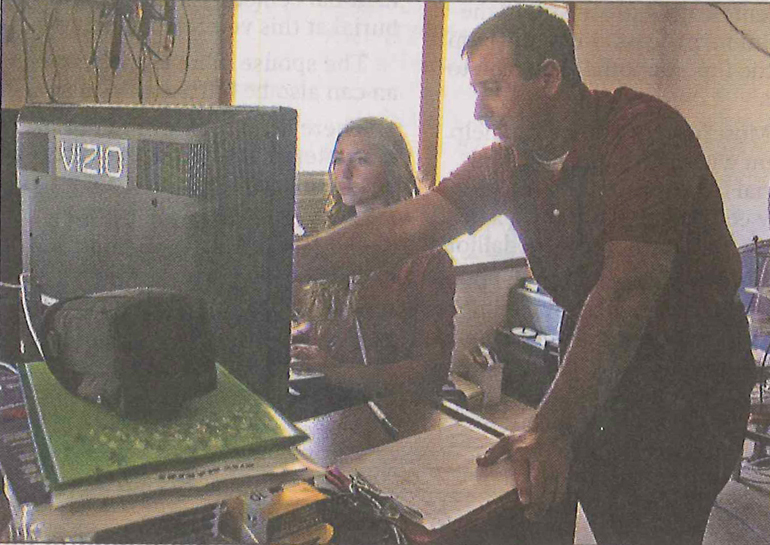 Noel Niehaus helps Ali Bryant design a cover for the CD that she recorded at Renegade Studio as part of the Ivy Tech summer business camp. Phillip Traicoff mixes A.J. Flynn’s bass track while Amy Beasley watches.